Exclusive! Sweet and sassy! 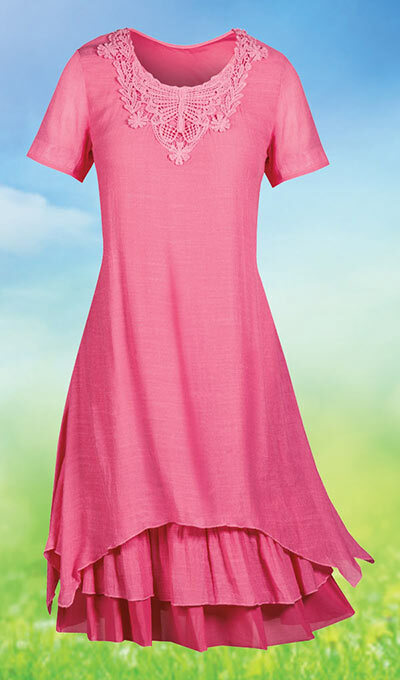 Turn heads with this vibrant feminine, short-sleeve Lavish Lace Appliqué Dress accented with delicate crocheted lace appliqués at the neckline. Shark-bite hemline features an enchanting ruffle detail. Woven viscose/polyester. Machine wash. Imported. Misses, approx. 40"l. Hurry! Quantities are limited!